Though it has been almost 50 years since the end of World War II, we should never forget the cruelty and injustices dealt to the Jewish people during that time. Tomorrow, April 28th, 2014 is Israel’s annual Holocaust Remembrance Day. For two minutes tomorrow morning air raid sirens will blow and individuals will stop, even getting out of their cars, and bow their heads in remembrance of those who died during those world shaking days when Hitler’s wrath was poured out upon a people, a country, and even the world. A recent article I read stated that an estimated 6 million Jews lost their lives, accounting for about one-third of the Jews across the entire world. That would mean one in three Jews died. From memorable individuals’ works such as the Diary of Anne Frank, to people who helped hide the Jews such as Corrie Ten Boom and her family, as detailed in The Hiding Place, first person accounts of heroism, secrecy, and horrors are handed down to us. We, as Christian’s today, are grafted into Christ (Romans 11:17-24). Jesus was a Jew. He was born of a Jewish mother and raised by a godly Jewish man. He was taught in the Jewish Temple. Christ performed his earthly ministry in Israel. And some day He will return, setting his feet on the Mount of Olives and shall rule in Jerusalem for 1,000 years. Things that happen to Israel should matter to us. 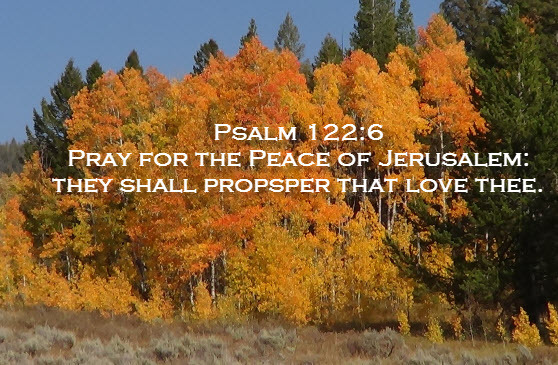 We are to pray for the peace of Jerusalem (Psalm 122:6). And I believe we need to pray for our country, that it will continue to work in the interests and behalf of Israel. Several years ago we met a missionary to the Jews who was a saved Jew himself. It was amazing to hear his testimony and how he was both born a Jew and how the practicing Jews look for the Redeemer. But then one day he was presented the Gospel and he realized that the very Redeemer the Jews have been seeking for thousands of years actually came to earth 2,000 years ago! He spoke of hope, his identity in Christ, and how his quest and burden for the Messiah had finally and completely been filled. He met Jesus Christ and accepted Him as his Lord and Savior. A question struck me once, “How have Christians been blessed through the Jewish people?”. To me, that is sort of like a fish asking, “How is water important to us?” God selected the descendants of Abraham as his chosen people. In the wilderness God threatened to destroy the Israelites when they lamented to go back to Egypt, but Moses acted as their intercessor and reminded the Almighty God of His promises to Abraham, Issac, and Jacob. And Moses was the very man God used to write the first five books of the Old Testament. So the Bible you hold in your hands was primarily written by the hand of various Jewish men. It was Bethlehem of Judea where Jesus was born on this earth. And in Acts 1: 8 it was Jerusalem from which the Gospel was carried to the ends of the earth. So, is Israel important? Yes! Does God still have a plan and purpose for the Jews? Of course! Will they someday realize as a race that Jesus is the Messiah? Yes, they will. I encourage you to pray for the peace of Israel. I encourage you to reflect on the freedoms we have in this country. And I encourage you to pray that we as a world will never forget the annihilation the Jews suffered at the hands of Germany in World War II. May we learn from history, not letting history be falsely rewritten by those who want to conceal the truth. And ultimately, may we not let tyranny come into power once again. « What Does the Bible Say About Gambling?